Kirk Bell December 19, 2017 Comment Now! But a funny thing has happened to sedans in the past couple of years. Sales of bread-and-butter mid-size sedans have fallen while crossovers have soared. Maybe it's time to do something different. Maybe the 2018 Buick Regal Sportback is it. Buick says it wants to explore white space in the market. We wouldn't say a mid-size hatchback is something entirely new. After all, Audi, BMW, Kia, and Porsche all have hatchbacks that are take-offs on the traditional sedan shape. However, the Regal Sportback isn't as premium as those cars, and it offers more interior space. It's basically a combination of a mid-size car and a crossover. Maybe that can win some buyers back to cars from the crossover craze. At a glance, it's hard to tell if the Regal Sportback is a sedan or a hatchback. It cuts a profile similar to that of the new Honda Accord, which is a sedan. And yet, the rear hatch opens in one piece. While the Regal Sportback is a hatch in the vein of the Audi A5 Sportback, BMW 3-Series GT, and Kia Stinger, it is bigger than those cars and offers more space in its cavernous hatch area. With the rear seats up, it has 31.5 cubic feet of space, which is essentially twice the size of a mid-size sedan's trunk. Fold those seats down, and you get a slope-roofed crossover in car form, with 60.7 cubic feet of cargo space. By comparison, the Mazda CX-5 has a 59.6 cubic foot cargo hold with the second row folded down. The Regal's second row folds either in a 60/40 split or a 40/20/40 split on higher-line models for longer items like skis to fit while still carrying two passengers in the outboard seats of the second row. The second-row seat is also more spacious than what you'll get in the hatchback competition. Despite the sloping roofline, head room is good for even those an inch or two above 6-foot, and leg room will work for a pair of Alan Aldas to sit in tandem. The news up front isn't as good. Sure, it's spacious and the seats are comfortable, but it's hard to see how Buick is a premium brand based on this interior. The Regal is based on a newer version of the same Epsilon II platform as the Chevrolet Malibu, and there isn't much difference in interior quality between the two. Sure, the Buick has some soft-touch materials on the dash and the door tops, and the look is cohesive and attractive, but everything belly-button level and below is hard plastic, and the plastic in the test cars at the media drive in Austin, Texas had some untrimmed flash in a few out-of-the-way areas. Ergonomically it's decent, but it could use more space to stow cell phones, keys, ham sandwiches, and the other detritus we carry every day. That space is limited to a wireless charging mat at the base of the center stack, a pair of cupholders on the center console, and a good sized center bin. The one area where Buick excels in is quietness. 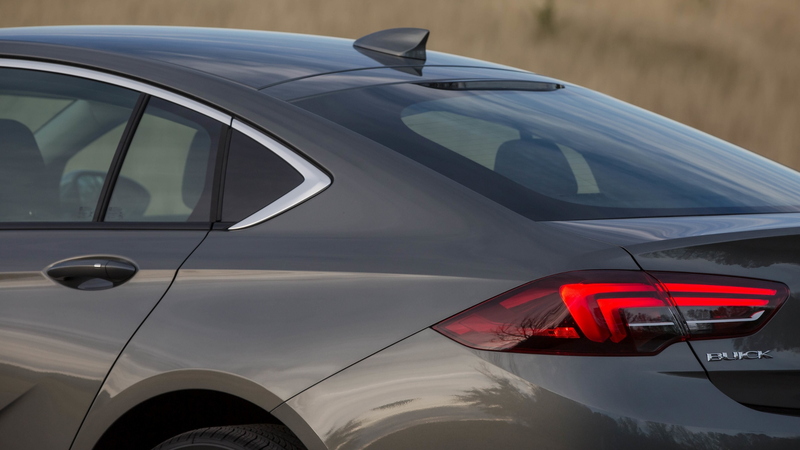 Buick puts in extra effort to block noise; the brand calls it QuietTuning. Buick didn't go deep into the efforts it made in the Regal Sportback, but it usually includes things like extra insulation, triple-sealed doors, and thicker glass. This car does have active noise cancellation, tire insulation, and a five-link rear suspension to damp out the sounds. The tires include a layer of foam that reduces road noise by as much as 2 decibels, a technology used by Rolls-Royce and very few others. Unfortunately for Buick, I can't really attest to the effectiveness of these measures because we drove mostly on coarse asphalt roads in Texas hill country. 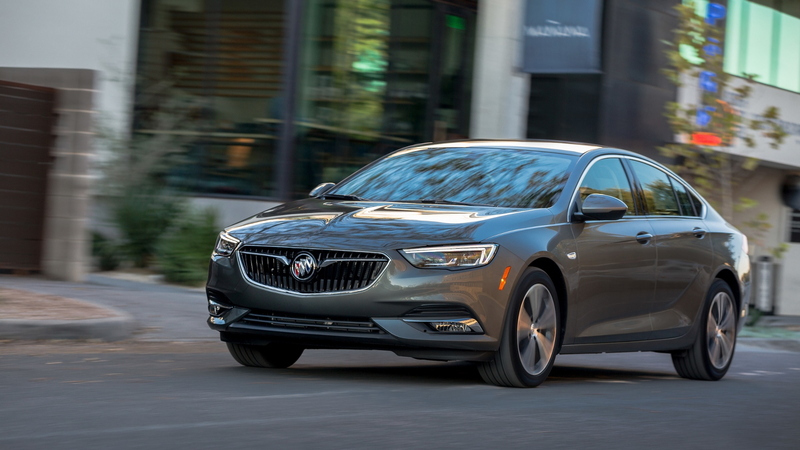 The 2018 Buick Regal Sportback is offered with one engine, a 2.0-liter turbo-4 making 250 horsepower and 260 pound-feet of torque in front-drive models and 295 lb-ft of torque when teamed with all-wheel drive. With front-wheel drive, it gets GM's new 9-speed automatic transmission, while AWD cars have an older Aisin 8-speed automatic. The available all-wheel-drive system has an active twin-clutch on the rear axle that can provide torque vectoring, though it is meant more for traction than performance. The system runs in a front-drive mode until needed and can send half its power to the rear axle. 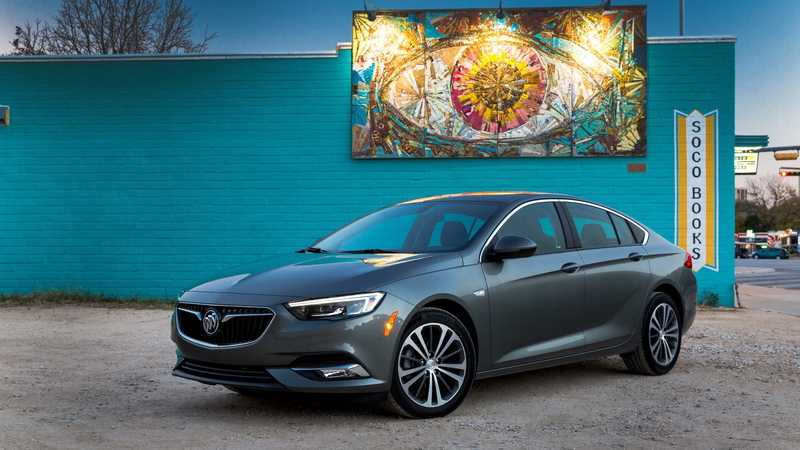 With either front- or all-wheel drive, the 2.0 is well-tuned in the Regal Sportback. The 0-60 mph sprint takes about 6.2 seconds, which is more than quick enough for any daily driver. The car has no mode selector and there is no Sport mode for the transmission. Instead, throttle response is simply satisfying (i.e. not too quick, not to slow), the shifts are responsive without holding the gears too long, and the powertrain simply does what the driver wants it to. The new 9-speed is especially well-tuned, providing a fine balance between power delivery and fuel economy. The same can be said of the chassis. This is a nicely tuned and dynamically capable mainstream car. The steering is direct and stable, though without a lot of feedback. The car turns in nicely and rotates well for a mid-size everyday driver. Braking is predictable and progressive. It's not a sport sedan, but it doesn't pretend to be. Instead, it's just very competent on the road. 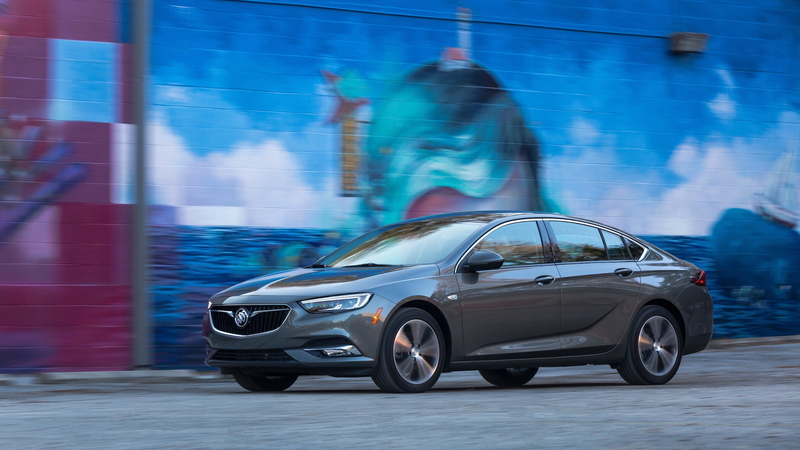 The 2018 Buick Regal Sportback starts at $25,915 for the base model, about $2,000 less than the model it replaces, and it comes with standard features such as keyless ignition, OnStar 4G LTE connectivity with a wi-fi hotspot, a 7.0-inch infotainment screen, and 17-inch alloy wheels. It also has basic equipment like cloth upholstery and manually adjustable seats. A Preferred I model runs $28,590, a Preferred II costs $30,665 or $32,540 with AWD, and the top-of-the-line Essence retails at $32,665 or $34,640 with AWD. You have to go to the Essence model to get standard leather upholstery and heated seats, and it also comes with an 8.0-inch version of the infotainment system, along with fog lights, and 18-inch wheels, among other things. The catch, however, is that Buick will only sell you its active safety feature bundle for the top model, and it requires another package before you can get it. Driver Confidence Package #1 costs $1,580. It has some convenience features, plus some safety features, including rear park assist, rear cross-traffic alerts, and blind-spot monitors. To get the really helpful stuff, though, you have to spend another $1,090 for Driver Confidence Package #2, which adds adaptive cruise control, forward collision warning with automatic emergency braking, and active lane control with lane-departure warning. That brings the total price of the truly safe Regal Sportback to $35,335 with front-drive or $37,310 with AWD. Shame on GM for making the safety features available for only the top model. At least Buick makes its new Active Safety Hood standard on all models. In the event of a frontal collision with a pedestrian, it pops up at the rear to help prevent injuries to the pedestrian. 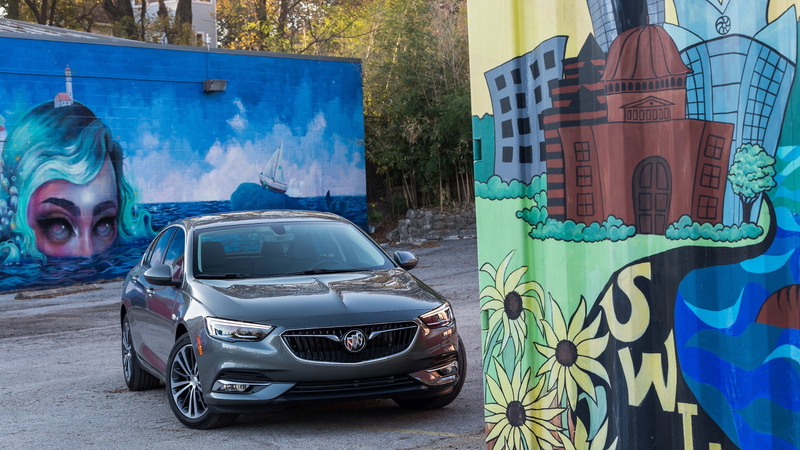 Despite that safety setback, the 2018 Buick Regal Sportback strikes me as a fine compromise between car and crossover. It has a lot of space to carry people and their stuff, and it drives better than just about any crossover, though you don't get that confidence that comes with a raised up, command seating position. The price is just about right, too, though it would be far better if Buick would make its safety equipment available for all models. Buick provided travel and lodging to Internet Brands Automotive to bring you this firsthand report.